What is Tiromel (Liothyronine) used for? 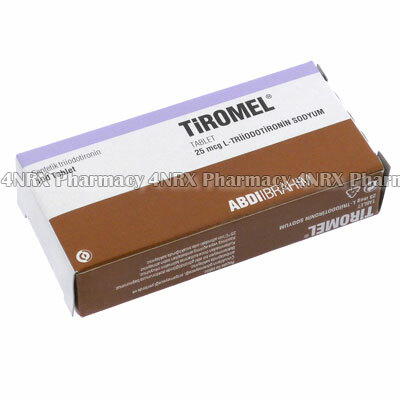 Tiromel (Liothyronine Sodium) is a synthetic hormone prescribed to treat patients suffering from an underactive thyroid gland. The medication boosts lowered hormone levels to relieve symptoms associated with this condition such as fatigue, muscle cramps, depression, or disrupted menstrual cycles. Your doctor may also prescribe it to treat other conditions that are not listed here. How should I use Tiromel (Liothyronine)? Tiromel (Liothyronine Sodium) is normally taken once daily at a dosage of one tablet, but your particular regimen will be determined by your doctor based on your symptoms and current health condition. Swallow the tablets whole with a large glass of water. Do not crush, chew, or split the medicine before use to avoid destroying or changing the effects of their contents. Always ask your pharmacist or doctor any questions you have to avoid any problems that may occur while using the medication. What are the side effects of Tiromel (Liothyronine)? Always inform your doctor immediately if any of these symptoms become severe or worry you as some may require immediate medical attention, reduced dosages, or other adjustments to prevent further problems. Do not begin using Tiromel (Liothyronine Sodium) if you have an overactive thyroid gland. Also disclose if you have diabetes, chronic hypothyroidism, or heart disease as these conditions may cause complications during your treatment. Strictly use Tiromel (Liothyronine Sodium) as prescribed and follow all instructions provided by your doctor. Safe, suitable, and optimum dosage can vary and is dependent on the patient`s health and medical history, as well as the condition you are treating. Tiromel (Liothyronine Sodium) may not be safe or suitable for all patients. Always ensure your doctor is informed if you are pregnant or breastfeeding, using any other type of medication (including non-prescription medicine, vitamins, and supplements), as well as if you have any allergies, other illnesses, or pre-existing medication conditions.